KeiteH wrote: But i also can confirm that the fix you made works as expected! mlc2000 wrote: I do have another question. Is there any way to make the custom radar bigger by modifying the numbers? I have tried and most I can do is 400x300 or 640x480. Feature suggestion. Is it possible to be able to implement an ability to save the satellite image and five day forecast as images for later sharing. Alternative the ability to share either to facebook or other social media site would be nice. pakenhamin wrote: Feature suggestion. 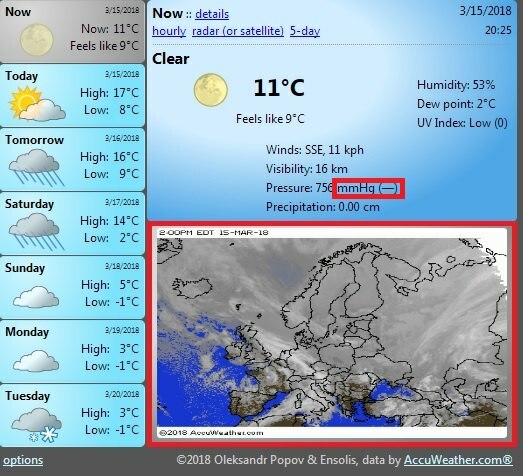 Is it possible to be able to implement an ability to save the satellite image and five day forecast as images for later sharing. So I was getting some browser lockups and general slugglishness overall with my home laptop and work laptop so I started monitoring CPU and memory usage over the last couple of days. I was noticing that any link I followed on any site was regularly adding 200 to 400 MB, sometimes up to 600 MB with each page load. The memory was not releasing quickly at all, so I could regularly drive the reported memory usage up to 4 to 5 GB pretty quickly. This is memory usage as reported by Windows 10 task manager. When I disabled forecastfox, the behavior stopped. I created a blank profile and only added this extension and was able to replicate the problem. Anything I can do to help you find the cause? smsmith wrote: Anything I can do to help you find the cause? you can try again your problem on current version 4.14? How to get old interface style back? I reverted to previus version, and disable automatic updates, until have option to back to old style interface. Fudeba wrote: How to get old interface style back? I want to suggest an option that that can be selected to move the Radar, 5 Day forecast, ect buttons to the other side of the forecast bar. What I want to do is recreate the layout that Forecast Fox used to existed when FF had a status bar. I like to leave the forecast bar collapsed in the lower left corner and be able to quickly check the radar without having to "click to expand" to keep the bar open, then navigating to the other far end. 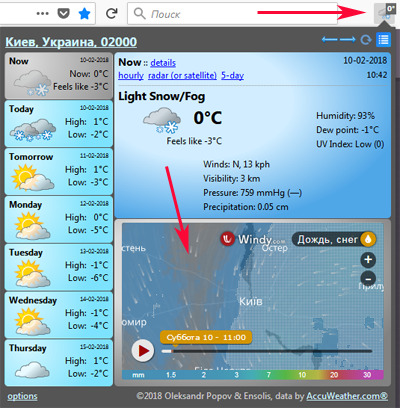 pschroeter wrote: ...quickly check the radar without having to "click to expand"
I love Forecastfox, it works really good. However I would like to know why the "Show the temperature on the button" is grey. It should be red. Sometime when I start Firefox the temperature on the button is RED but soon after it changes to grey. It is really disappointing. The temperature in RED color it looks much better and easy readable. I would appreciate your response and the changes the designers and developers could make to convert in RED the temperature on the button. 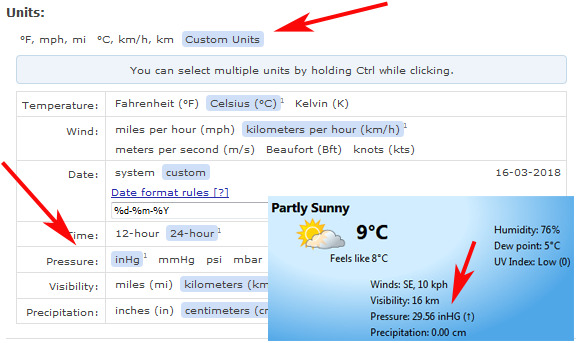 but be patient - in the future version I will be able to custom change the color of the button, forecastbar, etc. 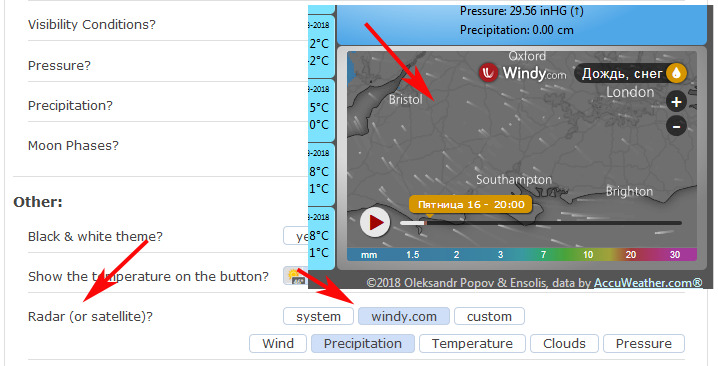 hi there pag77, ff ERS 52.0.1 and forecastfox 4.14 - does the new non working issue mean that I cannot change my location dynamically any more, but have to go to the options page (via the add-ons manager)each time? is there a way to change location dynamically? Last edited by adpucci on March 20th, 2018, 3:33 am, edited 1 time in total. 1. Pressure is showing mmHg and there is no option to change it to mbar. 2. When radar (or satellite) is off it still shows it. Necronomicon wrote: 1. Pressure is showing mmHg and there is no option to change it to mbar. Necronomicon wrote: 2. When radar (or satellite) is off it still shows it. i like the data of windy.com and that it's available as radar image here is +1 for me, i really like this. be really great, if you could support the use of these profiles here in forecastfox too. In the meantime, i appreciate your extention very much, thanks for your work!